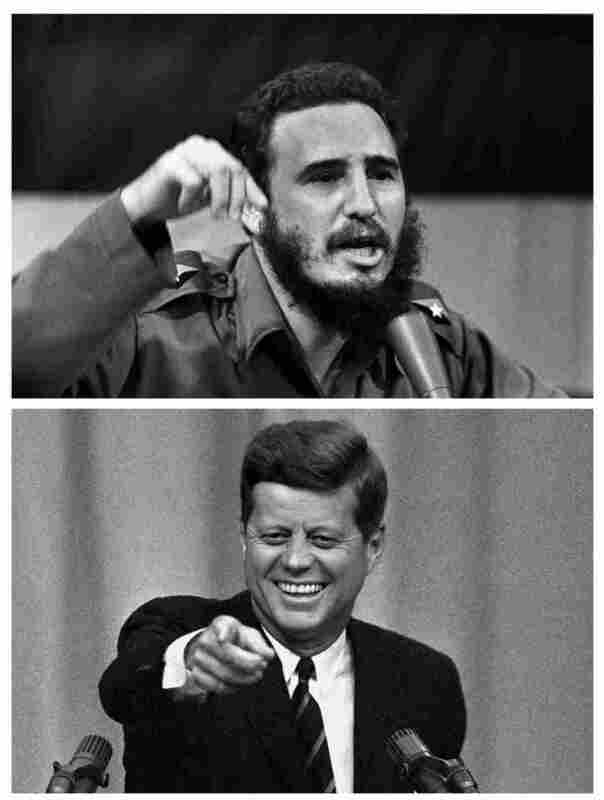 Cuban leader Fidel Castro delivering a speech in Cuba, on Oct. 23, 1962, and below, President John F. Kennedy calls on a reporter at a news conference in Washington, in April 1963. Among those present at the meeting, which took place on Sept. 6, 1962 — just six weeks before the Cuban Missile Crisis – included National Security Advisor McGeorge "Mac" Bundy; Attorney General Robert F. Kennedy; Air Force Gen. Edward Lansdale, who led clandestine operations against Cuba; and Edward R. Murrow, the famous broadcast reporter who was serving at the time as the director of the U.S. Information Agency, and Deputy Director of Central Intelligence, Gen. Marshall Carter. 55 Years Later, What Is Still Misunderstood About The Cuban Missile Crisis? An apparent plan to use balloons to drop propaganda leaflets over Cuba: "After considerable discussion, it was agreed that details should be presented to the Group, to include the content of the leaflets which would be dropped, and specifics as to the method and place of launching, the technical details of the release of leaflets, etc., etc." Possible disruption of Cuban radio and TV broadcasts: "Mr. Murrow explained the far-reaching reactions that the Cubans could mount against U.S. radio stations, and said that he felt on balance it would not be profitable to provoke this kind of electronic warfare." Unspecified economic sabotage actions aimed at "wrecking the Cuban economy." The introduction of biological agents, which would "appear to be of natural origins" to produce crop failures. One of the members present, Gen. Carter, "emphasized the extreme sensitivity of any such operation and the disastrous results that would flow from something going wrong, particularly if there was obvious attribution to the U.S." Bundy said he wasn't worried "about any such sabotage which could clearly be made to appear as the result of local Cuban disaffection or of a natural disaster, but that the [U.S.] must avoid external activities such as release of chemicals, etc., unless they could be completely covered up." Infiltrating and distributing "small explosives or incendiaries" to (anti-Castro) Cubans. Gen. Carter notes a problem: "the people have shown no inclination to use such materials despite many exile claims to the contrary."